Battleground Fantasy Warfare is a miniatures game with a difference... that difference being that there's no miniatures. Instead, units and heroes are represented by cards that are moved around the battlefield. The game's first faction, the Men of Hawkshold, are getting themselves a reprint. But it's not only a reprint, it's also rolling in some updated artwork and rules. The set is on Kickstarter now. Battleground Fantasy Warfare is a miniatures game — only without the miniatures! Units are represented by cards portraying the warriors and their characteristics. Each player builds their army, deploy their units, and assigns them orders. Once the battle begins, each player only has a limited ability to command their army. The player with the better plan can use their commands to inspire or enchant their units in combat. Quick to set up, easy to store, Battleground is a game that can be played at your kitchen table and carried in your pocket. And yet Battleground is a deeply tactical game, where maneuver and marshaling your limited command resources are the keys to victory. 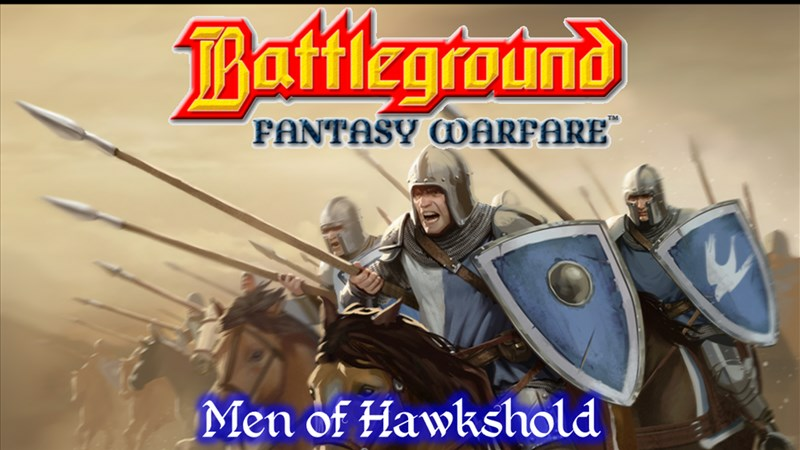 The ancient alliance that binds together the Holds of Men was built around Hawkshold. When Orc invasion or outbreaks of necromancy threaten the lands, Hawkshold's armies mobilize. Yet the kingdom finds itself stretched thin, unable to meet all of its obligations. The newly crowned Grand Duke has instituted sweeping reforms to replace the feudal army with a standing, professional force. In the meantime he has recruited mercenaries all across the realm, from the mountainous highlands to the coastal cities. The young Duke is transforming his realm at every level so that Hawkshold retains its primacy. Hawkshold is a disciplined, combined arms faction. It has the flexibility to field a variety of armies. Your Spearmen can be a redoubt for a strike wing of Lancers. Or they can be the rampart protecting the Longbowmen who rain destruction upon your enemy. Or your Lancers can form the core a rapid attack force alongside Knights and Scout Cavalry.